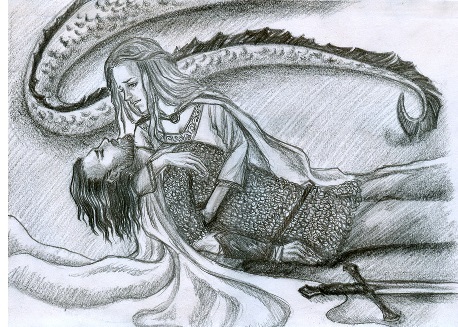 Túrin & Nienor - When a dragon attacks, it brings more than fire to the battle. It also has the power to cast paralyzing fear upon its enemy. And so it was after the destruction of Nargothrond when Túrin, son of Húrin, stood alone against Glaurung. For Túrin had been separated from his mother, Morwen, and his sister, Nienor, for years and was unaware if they lived or had died in the time when Morgoth unleased his carnage on Beleriand. Indeed, they had been apart for so long, that he had not even known his younger sister. But now, with his father, Húrin, captured by the enemy and held captive in Angband, his thoughts turned to his unaccounted for kin. He traveled to his home in Dor-lómin, but found them gone, having fled to Doriath, ironically to search for him. In the meantime, Túrin tried to overcome a curse from Morgoth on his family by changing his name to Turambar (which means "Master of Doom"). Word of the Fall of Nargothrond arrived in Doriath soon after, and Morwen was distraught by the news. She left the Elven realm, to search once more for her son. Nienor was ordered to stay behind, but disguised herself as an Elf sent by Thingol to protect Morwen. But Glaurung was aware of their approach and attacked them at the hill of Amon Ethir (Hill of Spies). The party was scattered and Nienor found herself alone, face to face with the terrible dragon. And after awhile, not knowing they were brother and sister, they fell in love, and were married; and eventually Níniel conceived a child. They lived in Brethil, and Turambar vowed not to go to war so long as he was tied to Níniel, save only if their homeland came under attack. But he could not avoid his fate. 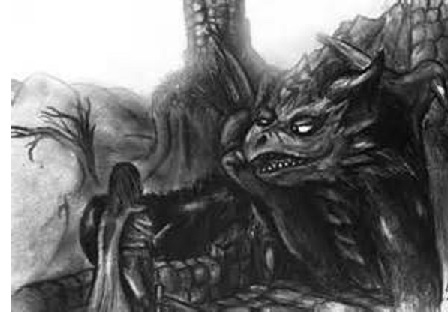 News of the Black Blade (the sword Anglachel, which Túrin now wielded and called Gurthang) reached Glaurung, and he set out from Nargothrond to attack Brethil where it was. So Turambar had cause to do battle and he went out to meet the dragon. 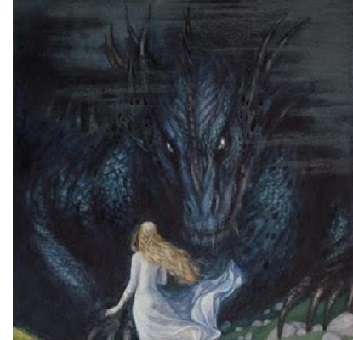 "Now Turambar came to Nen Girith at sundown, and there he learned that Glaurung lay on the brink on the high shores of Teiglin, and was like to move when night fell. Then he called those tidings good; for the dragon lay at Cabed-en-Aras, where the river ran in a deep and narrow gorge that a hunted deer might overleap, and Turambar thought that he would seek no further, but would attempt to pass over the gorge. Therefore he purposed to creep down at dusk, and descend into the ravine at night, and cross over the wild water; and then to climb up the further cliff, and so come to the dragon beneath his guard. 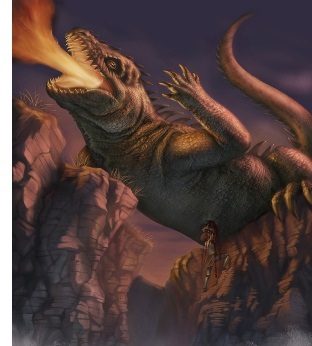 Glaurung, the first of the great dragons of Middle Earth, was dying. But even in his doom, he was able to strike out one last time. "Now Gurthang had been wrested from Turambar's hand in the throe of Glaurung, and it clave to the belly of the dragon. Turambar therefore crossed the water once more, desiring to recover his sword and to look upon his foe; and he found him stretched at his length, and rolled upon one side, and the hilts of Gurthang stood in his belly. Then Turambar siezed the hilts and set his foot upon the belly, and cried in mockery of the dragon and his words at Nargothrond: 'Hail Worm of Morgoth! Well met again! Die now and darkness have thee! Thus is Túrin son of Húrin avenged. The sounds of battle reached Niniel and she, along with a man named Brandir, went to see what had transpired. Suddenly in her anguish, she threw herself from the edge of Cabed-en-Aras and was drowned in the Taeglin River below. But as it happened, Túrin was not dead. With the death of Glaurung, the spell on him had also been broken and he was roused from his slumber. Wandering back to Brethil, he was told by Brandir what had happened to Níniel, and that her real name was Nienor, daughter of Húrin. And when Túrin realized that Níniel was his sister, Niener, he flew into a rage and struck down Brandir (the reason for this is too involved to include here, so if you want to get the full story, please read chap. 21 of the The Silmarillion). Then in his grief, he threw himself on his sword, Gurthang, and took his own life, thus ending the tragic (and slightly weird) tale of Túrin & Nienor.